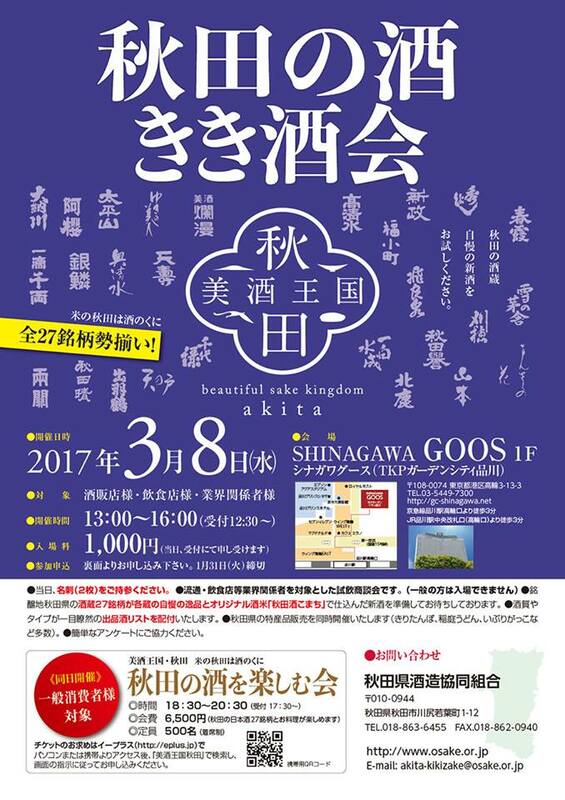 The popular event hosted by Akita Sake Brewers Association and held in Tokyo around March every year, “Meeting for Enjoying Akita’s Sake”, will be held at Shinagawa Goos on 8th March 2017. From 1:00 p.m. to 4:00 p.m., “Meeting for Tasting Akita’s Sake” will be held only for sake retailers, restaurants, and the people concerned with sake. After that from 6:30 p.m. to 8:30 p.m., “Meeting for enjoying Akita’s Sake” will be held for general consumers. You can enjoy not only 27 brands of Akita’s sake and delicious cuisine, but also the performance of “Sake Brewer’s Song” by “Sannai Toji”. Of course, Takashimizu also prepares delicious sake and waits for you. Please feel and enjoy Akita in Tokyo with your friends and family. Please confirm the following website (in Japanese) for further information.